The connection between Jiminy and Gregory? Spring is almost here! And what better way to celebrate than with the return of the Cafe's most popular game! 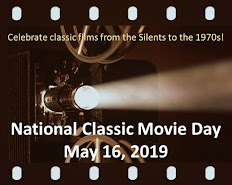 You will be given a pair or trio of films or performers, your task is to find the common connection. It could be anything--two stars who acted in the same movie, two movies that share a common theme, etc. As always, don't answer all the questions so others can play, too. There is a single best answer for each question. 1. Sharon Tate, Stella Stevens, and Ann-Margret. 2. Leo G. Carroll and Richard Anderson. 3. Elsa Lanchester and Veronica Carlson. 4. David Hasselhoff and Jerry Van Dyke. 5. Ronald Colman and Ray Milland. 6. Warner Oland and Michael Landon. 7. Otto Preminger, Anne Baxter, and Art Carney. 8. Sandra Dee, Lesley Ann Warren, and Karen Valentine. 9. Judy Garland and Moira Shearer. 10. Spencer Tracy and Errol Flynn. 11. 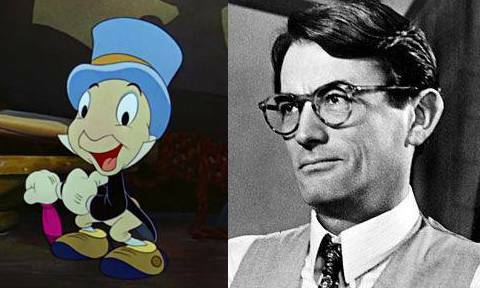 Jiminy Cricket and Gregory Peck. 12. Christopher Lambert and Jock Mahoney. 13. Faye Dunaway, Buddy Ebsen, and James Dean. 14. Audrey Hepburn and Natalie Wood. 15. Elizabeth Taylor and Dumbo. Thanks for getting this edition off to a great start! And I liked Jock Mahoney's Tarzan. Ah, you know your talking cars and werewolves! #5 - Both in the first and second Beau Geste adaptations, respectively. # 1, each co-starred with Dean Martin in a Matt Helm movie. Bizarrely, I literally watched the other one in the series, with Janice Rule as his co-star, just last night! # 7, each were Batvillains. Very good on both, Grant! I always liked Janice Rule. #2, Maybe they were both bosses of TV espionage agents, of The Man from UNCLE and The Six Million Dollar Man. That is true, but there's a more interesting connection. 14. Marni Nixon - dubbed for Natalie Wood vocals in West Side Story and also dubbed for Audrey Hepburn in My Fair Lady. My favorite question on this quiz! Well...you are right, of course! 3. Elsa Lanchester and Veronica Carlson were both in Frankenstein movies. 5. Colman and Milland both played Bulldog Drummond. Correct on both counts. Great job! This quiz is moving right along. The only unanswered questions are 10, 13, and 15. There's also another answer for 2. 13. All three have oil on their properties. Dunaway in Oklahoma Crude, Ebsen in the Beverly Hillbillies, and Dean in Giant. Excellent job on what was probably the toughest question on this quiz! Sadly, I saw this post too late to jump in on a few of these excellent questions! Nice job, everyone! As for another answer for #2: I believe Richard Anderson guest starred in an episode of The Man From U.N.C.L.E., which featured Leo G. Carroll as Mr. Waverly and both actors were featured in sci-fi films in the 50s; Carroll in "Tarantula" and Anderson in "Forbidden Planet" and "Curse of the Faceless Man"
Very interesting! Another connection is that Anderson and Carroll played the same characters on two different TV series. Carroll was Mr. Waverly in both U.N.C.L.E. 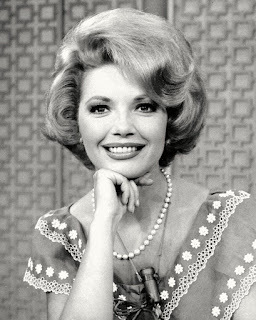 TV series and Anderson portrayed the boss of both THE SIX MILLION DOLLAR MAN and THE BIONIC WOMAN. That's right, Rick! I forgot about that! Nice one! By the way, Anderson actually guest starred in two U.N.C.L.E. episodes: The Quadripartite Affair in Season 1 & The Candidate's Wife Affair in Season 3. 10 and 15 still need answers! #15. Taylor did Elephant Walk? And that wraps up this month's game. Thanks to everyone who played!